From the moment that Marie von Sivers met Rudolf Steiner in 1902, their relationship became key to the development of anthroposophy. Marie Steiner's immense contribution is well known in the fields of eurythmy, speech, the arts, and in her management and publication of Steiner's literary estate - but she also assisted in almost every aspect of Rudolf Steiner's work. So why has she been so neglected by the anthroposophical movement? 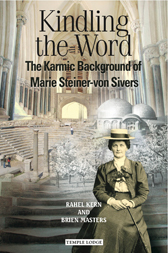 Driven by this central question, the authors of this penetrating study came to the conclusion that the karma and mission of Marie Steiner-von Sivers is of vital importance to the present and future spiritual and cultural development of the West. They evaluate Marie's 23-year partnership with Rudolf Steiner, but also her three previous incarnations: in the Ancient Orphic Mysteries, as the Neoplatonist Hypatia, and as Albertus Magnus. The lives, deeds, cultural legacies and thought of these various personalities are addressed through a series of lucid essays, interspersed with studies on the missions of both Rudolf and Marie Steiner. These are supplemented with short extracts from literature which reverberate with the word, helping to reveal the intimately intertwined karmic missions of Marie Steiner-von Sivers and her work-companion and soul-partner, Rudolf Steiner. BRIEN MASTERS' career has included two professions, in music and education, the latter the focus of his PhD. In addition, he has pursued a decades-long interest in the anthroposophical approach to karma and reincarnation, which has resulted in lectures and workshops on Schubert, Wagner, Böcklin and Garibaldi, and published articles on Emerson and Oliphant. After various appointments, which included lengthy periods serving as Choirmaster and Organist in the Anglican Church, Chair of the Steiner Schools Fellowship, Editor of Child and Man / Steiner Education and Director of the London Waldorf Teacher Training Seminar, Brien Masters is now largely retired, though still lecturing and writing. RAHEL KERNÂ was born in Germany in 1978 but moved to England after completing school education. She studied for a BA and MA in Philosophy at the University of Reading with a particular focus on modern European Philosophy. She has been an avid student of anthroposophy since her teens, with a particular interest in Steiner's contributions to philosophy and the evolution of consciousness, as reflected in the development of thought throughout the centuries. She currently lives in London and works in international marketing. Her work takes her on frequent travels around the globe.